A data acquisition system was built to assist the Bradley University mechanical engineering team in the annual SAE formula car race. Previous vehicle failures with the formula car have prevented the team from competing, so the intent of this system is to permit the team to monitor the car for warning signs associated with various failures. Potential catastrophic failures can be identified before they occur through real-time information sent to the driver and crew, including a warning system that notifies the team when critical parameter values no longer lie within acceptable ranges. The system uses a microcontroller to read data from sensors on the car, converting the data to the proper format before sending it to the driver’s display and a wireless transceiver that transmits the data to a track-side laptop. This system would not only help ensure the safety of the Bradley University Formula SAE team, but would provide the team with a continually updated overview of the car’s operational status. 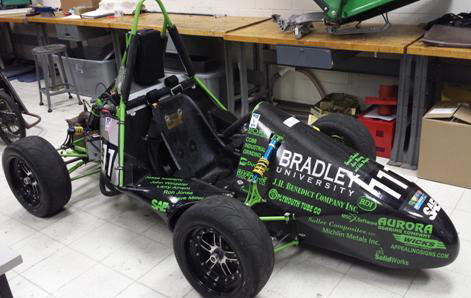 Unfortunately, shortly after this project was started the Bradley University Mechanical Engineering Formula SAE team disassembled the vehicle that was originally specified as the target for the finalized system. Therefore, the completed data acquisition system could not be tested on a Formula SAE car.